Size: 25.5cm x 15cm. Perfect for marketing the Dr.'s Remedy Nail Care Products. 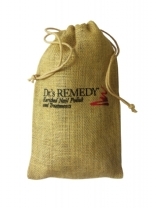 The natural fiber of the bag is a reflection of the natural ingredients in the Dr.'s Remedy products.